Since the average project receives over 100 entries, it's understandable that you might have trouble picking just one. But don't worry - now, just as in real life - you can add the opinions of your friends, family, colleagues and customers into the mix! 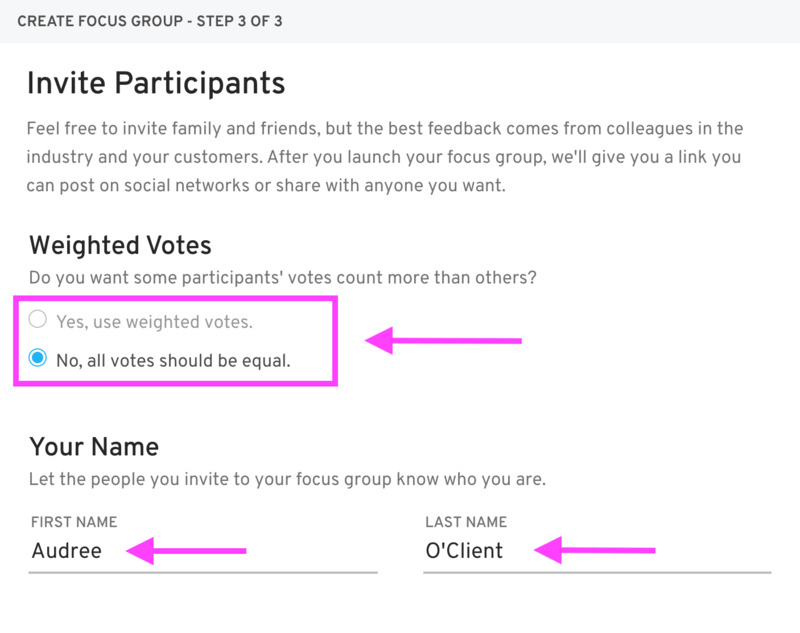 When you launch a focus group (some people refer to focus groups as polls), you’ll be able to pick your favorite 12 entries and then ask your friends, family, coworkers or anyone you want, to comment and vote on their favorites. You can launch a focus group at any time in your project - although it’s a good idea to wait until near the end of the project once you've received all your favorite entries. Anyone is eligible to vote - as long as they have the special voting URL we'll provide you. They don’t even have to register on crowdspring to participate! Silver projects come with one focus group, but you can always upgrade to unlimited focus groups for $29.99. In Gold, Elite and Platinum projects, you can launch unlimited focus groups without any added cost! How are Focus Groups different from Presentations? Presentations are designed for you to share designs privately with your clients on a white label mini-site. There is no public link to a presentation and each person will be required to have a login and password in order to see your presentation mini-site. 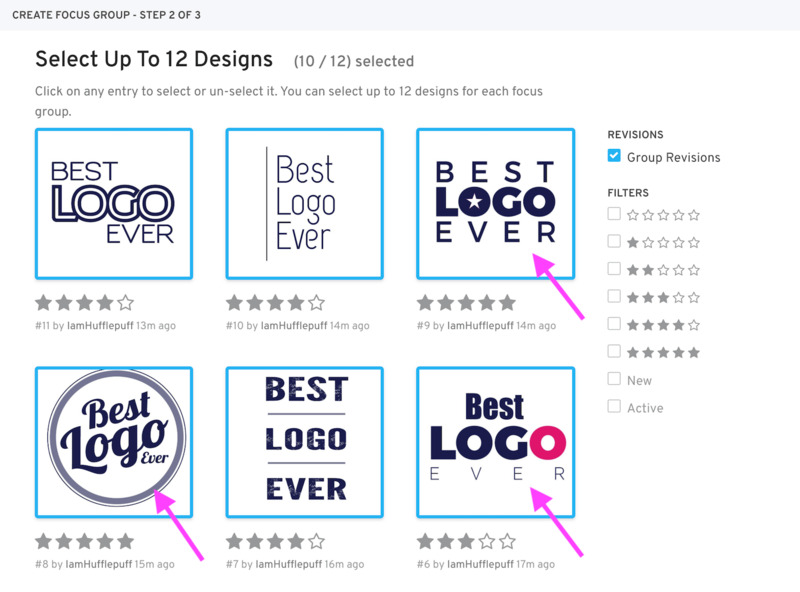 Focus Groups, on the other hand, are designed to let you invite many people to vote on their favorite designs from your project. You can include people you know, and even people you don't know personally (such as Twitter followers or customers), to help you pick a design in your project. You'll have a public link to your focus group and people won't need to log-in to participate. Presentations are not available in Silver projects, are optional in Gold and Elite projects ($99 upgrade), and are included at no additional charge in Platinum projects. To get started with your focus group, look to the top left side of your screen and find the words “Focus Groups” as shown below. 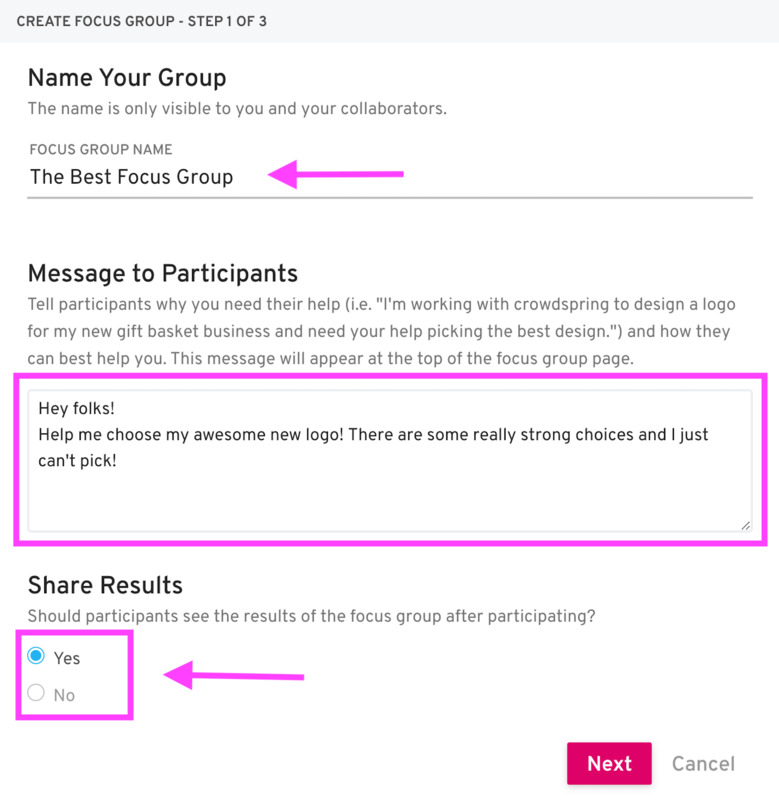 Click there and you’ll see the pink “Create A Focus Group” button. Click the button and you’ll be on your way! In Step One, you’ll set the basic foundation for your focus group. You’ll start by naming your focus group. Enter the name in the field at the top of the screen (see below). Pro Tip: If you plan to hold multiple focus groups, make sure you give them unique names so that you can easily identify the right one! Next, enter a message to your participants - this message will appear at the top of your focus group. Include any information that will let your focus group participants know what to look for and what kind of feedback will be most useful to you. Now, it’s on to Step 2! Click the pink “Next” button to move on. In Step Two, you’ll choose the entries you want to include in your focus group. You can select up to 12! Scroll through your options and click the entries you’d like to include. Once you’ve selected your entries, click the pink “Next” button to go on to Step Three. Step Three is where you will fill in the final details before you launch your focus group and send it out to your colleagues, clients, customers or friends. Start by deciding whether you want certain people's votes to count more than others. Click the circle next to your preferred option (see below). The next part is super easy - just enter your first and last names in the appropriate fields under "Your Name." Now, it's time to add the participants to your focus group. Enter each participant's email address into the "Email" field (just type right over where it says "Email"). Then click the blue "Add" button to add them to your focus group. Once you've added a participant, you'll see their email address appear in the list beneath the blue "Add" button as shown in the picture below. You have to add at least one participant here or you won't be able to launch your focus group. But, you will have the chance to simply copy and share your focus group link once it has launched. So, don't feel the need to add everyone here if you'd rather share it via social media or in an email blast to your clients or colleagues. The "Personal Message" field is where you will enter the message that will be included in the focus group invitation your participants receive. So, think about what you'd like to say to your participants in your invitation and enter that message here. You can also click the blue "preview the invitation" link to see a preview before you send! 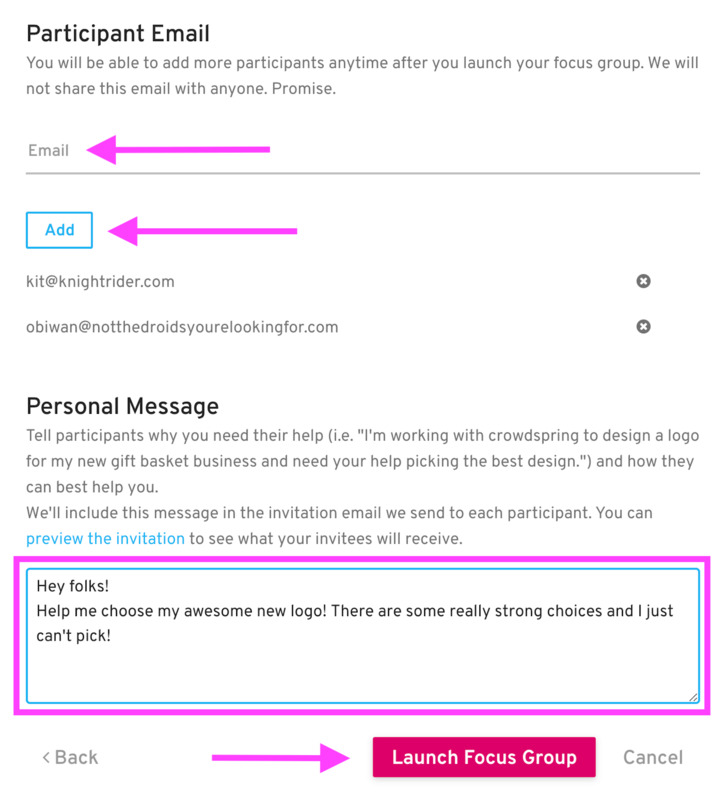 Finally, click the pink "Launch Focus Group" button to send your invitations and make the focus group live. And, now that your focus group is live, you can feel free to copy and share the link on the right side of your focus group via direct email or your social media platform of choice! This is a great way to build awareness of your new brand and get lots of valuable opinions. If you have any questions about focus groups, feel free to reach out to our handy customer support team. They'll be happy to help.